The Pittsburgh Modular DNA Symbiotic Waves is a powerful 9-bit digital oscillator and waveform processor. A unique dual oscillator system paired with a comprehensive waveform processing and modulation section. Even with all this power, the interface of the Symbiotic Waves module is as intuitive and easy to use as all of the analog Pittsburgh Modular eurorack modules. Nothing is hidden behind layers of menus, secret button combinations, or hard to understand graphics. This is naked digital synthesis. The oscillator is divided into master (wave 1) and slave (wave 2) waveform generators. Each oscillator offers a wide range of operation without frequency stepping or zippering artifacts. The master pitch is set using the frequency and fine tune knobs. The pitch of the slave oscillator is tied to the frequency of the master oscillator but can be offset up to an octave using the wave 2 detune knob. Each oscillator offers 16 different single cycle waveforms. The waves are fine tuned to celebrate digital aliasing and bit-rate artifacts. Symbiotic Waves mixes the output of the two oscillators using a unique waveform processor. The processor combines the waves using 1 of 16 different methods. Each processor mode offers manual and voltage control over wave balance and a mode specific controller function. For phase distortion processing, the combined signal of Wave 1 and Wave 2 is stored as 256 separate values, the stored signal is recalled from memory using a counter known as a ‘phase accumulator’. For normal output of the stored signal, this counter is incremented once for each of the 256 steps of the 8 bit cycle - the phase accumulator represents a sawtooth waveform in this case. If we mix a different waveform with this sawtooth shaped phase accumulator, this changes the order in which the 256 steps of the stored signal are read from memory. If Wave 2 is detuned from Wave 1, this can create interesting changes in the resulting ‘phase distorted’ output signal. Processor Function: Sums Wave 1 and Wave 2 and adds very low pitched phase distortion. Balance Knob Function: Wave 1 and Wave 2 balance. Controller Knob Function: Adjusts the balance of the combined waves and the phase distorted signal. Processor Function: Sums Wave 1 and Wave 2 and adds a lower pitched phase distortion. Controller Knob Function: Adjusts the character of the phase distorted signal, from full to almost DC. Processor Function: Sums Wave 1 and Wave 2 and combines this with a delayed version of the signal. The delay effect is applied continuously to the oscillator signal, and is grainy in character. Controller Knob Function: Adjusts the delay time. Delay time is also affected by Pitch; the higher the pitch, the shorter the delay time. Processor Function: Multiplies Wave 1 and Wave 2 and adds very low pitched phase distortion. Balance Knob Function: Mixes Wave 1 signal with the FM'ed signal. Processor Function: Multiplies Wave 1 and Wave 2 and adds a lower pitched phase distortion. Processor Function: Multiplies Wave 1 and Wave 2 and combines this with a delayed version of the signal. The delay effect is applied continuously to the oscillator signal, and is grainy in character. Processor Function: Sums Wave 1 and Wave 2 and combines this signal with a detuned copy, effectively giving the sound of 4 oscillators. Controller Knob Function: Amount of detune applied to the copied signal. Processor Function: Subtracts Wave 1 from Wave 2 and mixes the combined signal with a phase-offset version of the same signal. Hard clipping is introduced where subtraction crosses zero or addition exceeds maximum. Controller Knob Function: Phase shift amount of the processed waveform. Processor Function: Sums Wave 1 and Wave 2 and adds wavefolding. Controller Knob Function: Amplifies the combined signal of Waves 1 & 2 until it reaches the maximum output value then folds the waveform back on itself. Processor Function: Sums Wave 1 and Wave 2 and adds pitch synchronization. Controller Knob Function: Increases the pitch of the combined signal of Waves 1 & 2 while synchronizing this to the pitch of Wave 1. Processor Function: Switches between Wave 1 and Wave 2 and adds phase distortion. Controller Knob Function: Mixes the switched signal with a phase distorted version of the signal. Processor Function: Sums Wave 1 and Wave 2 and adds bit shifting. Controller Knob Function: Shifts the least significant bit of the output signal towards the most significant bit, from 0 to 7 times. Processor Function: Sums Wave 1 and Wave 2 and adds an IIR phaser effect. The phaser works best on harmonically rich sounds, and can clip at times. Controller Knob Function: Adjusts the phase angle. Processor Function: Sums Wave 1 and Wave 2 and adds a very distorted phaser effect. This is an IIR phaser followed by a comparator which feeds back into the phaser’s input. Frequency Control Knob: Adjusts the center frequency. Fine Tune Control knob: Fine tune frequency adjustment. Wave 2 Detune Knob: Adjusts the pitch of wave 2 relative to wave 1. Range is 0 to +1 octave. Wave 1 Select Knob: 16 step waveform selector. 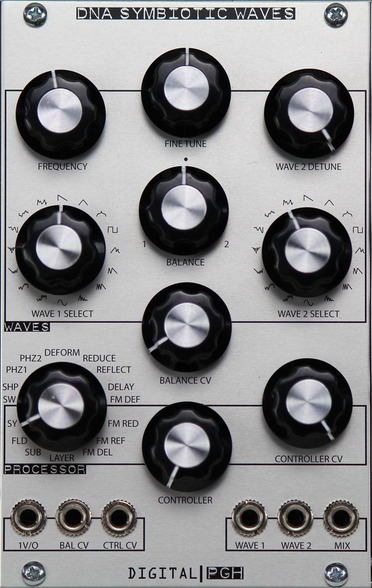 Wave 2 Select Knob: 16 step waveform selector. Balance Control Knob: Adjust the processor output balance between wave 1 and wave 2. Balance CV Attenuator Knob: Balance CV input attenuator. Processor Selector Knob: 16 step processing mode selector. Processor Controller Knob: Processor mode specific function controller knob. Processor Controller CV Attenuator Knob: Processor controller CV input attenuator. 1 V/O Input: One volt per octave CV input. Control CV Input: Processor control CV input. Wave 1 Output: Preprocessor waveform output of Wave 1. Wave 2 Output: Preprocessor waveform output of Wave 2. Processor Mix Output: Post processor mix output. Power Usage: +12v 75mA, -12v 15mA. Does not require +5v.